Shakespeare in the Park tickets are FREE, but very difficult to get! Shakespeare in the Park tickets are available only on the day of the show in one of four ways: in person at Central Park, in person in one of the Boroughs, in person at Astor Place or by online lottery. NYC Insider Guide to the rescue…my buddy, Mike, NYC’s ticket expert, will go in person for you and secure your tickets! 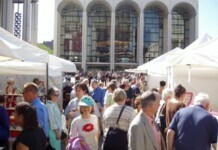 Mike provides a line-sitting service for Shakespeare in the Park – he waits on the endless line, gets your tickets and will even deliver them right to you on the day of the performance anywhere in Manhattan. If you provide Mike at least one-day’s notice, the service fee is as low as $75 per ticket (but can be higher), whether you want just a pair or a group of seats together. 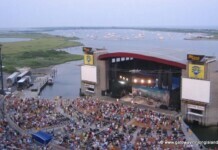 Contact Mike at NewYorkTickets (at) yahoo.com or (917) 773-8587 and tell him NYC Insider referred you! Another way to secure guaranteed, no-hassle Shakespeare in the Park tickets and great seats? Make a $200 tax-deductible donation to the Public Theater, so you not only get guaranteed seats of your choice, but support all future performances. Learn more about getting Shakespeare in the Park tickets. The Theater is north of 79th Street, around 81st St, slightly more towards the west side. In this modern production, we find the community of Messina celebrating a break from an ongoing war. But not all is peaceful amid the revelry, as old rivals engage in a battle of wits, unexpected foes plot revenge, and young lovers are caught in a tumultuous courtship – until love proves the ultimate trickster, and undoes them all. Tony Award winner Kenny Leon (American Son, A Raisin in the Sun) directs a bold new take on Shakespeare’s cherished comedy of romantic retribution and miscommunication, MUCH ADO ABOUT NOTHING. Set amid war and palace intrigue in the 17th-century Mediterranean, this classic drama about a noble Black Venetian general whose marriage is sabotaged by theater’s most infamous villain, Iago, remains Shakespeare’s most urgent and relevant tragedy today. A lush, romantic vision gives way to the violent tangle of love and jealousy, race and revenge in this must-see production of Shakespeare’s great tragedy, OTHELLO. Twelfth Night returns to Central Park to build upon its original Labor Day production in an all-new staging for a full five-week run. Professional artists and two rotating ensembles of community members from all five boroughs will perform together on the Delacorte stage in this enchanting comedy about Viola, a young heroine who washes up on the shores of Illyria, disguises herself as a man, is sent to court a countess, and falls in love with a Duke. "Shakespeare’s classic about young love, old enemies and the eternal magic of storytelling. Exiled to a fantastical island, Prospero unleashes a churning storm to shipwreck the traitor brother who stole his throne and settle the score once and for all. But bitter revenge is upended by newfound love in this sublime masterpiece that proves we are all "such stuff as dreams are made on." "In the Shakespearean fairytale Cymbeline, Princess Imogen’s fidelity is put to the royal test when her disapproving father banishes her soul mate. Cross-dressing girls and cross-dressing boys, poisons and swordfights and dastardly villains all take the stage in this enchanting romp about the conquering power of love."